Choosing the right lift for your boat lift or jet ski lift for our area in Gulf Shores, Orange Beach, Perdido, Elberta, Foley. Nothing will protect your investment like a boat or jet ski lift. When not in use, your boat or jet ski is resting high and dry – above the water – avoiding marine growth, osmosis, and electrolysis. A boat or jet ski that is on a lift will also avoid banging against the dock as the result of a loose or broken rope. Regardless of what type of boat or jet ski slip that you have, whether it is in a marina, community dock, or a private slip, at Dock and Decks we custom build each boat or jet ski lift to fit just about every application. Dock and Docks also offers custom kayak hooks and lifts. Other things that you have to consider when choosing a boat or jet ski lift are permitting requirements, HOA restrictions, and any regulations that your marina may have in regard to attaching equipment to the dock structure. Four post lift and boat house lifts are the most common in Gulf Coast area—Orange Beach, Perdido, Foley, Gulf Shores, Elberta area—or our new exciting low profile lift design; which hides more of the mechanics and opens up your view from your custom build dock or deck! There are several things that Dock and Decks discusses with their clients to determine the best boat or jet ski lift design to best fit your needs. Does your dock have a roof structure? If so, is it high enough to allow for your boat to be lifted out of the water? More importantly is the roof structure strong enough to support a suspended boat lift, including the live weight of your boat? 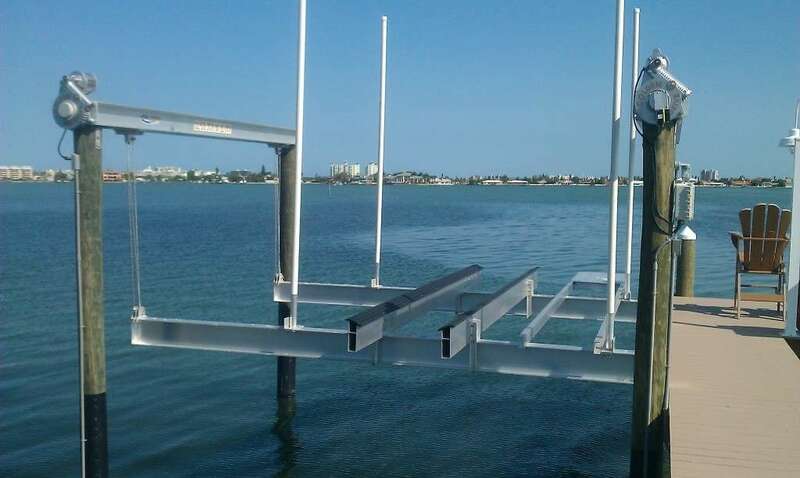 Are your pilings sturdy enough to support the installation of a boat lift or jet ski lift? Dock and Decks also dives your current dock to check your current pilings; do they need replacement or pile wrapping to preserve the life of the piling? What is the water depth in your slip? Is it deep enough for the boat lift structure to submerge enough to launch your boat? What is the length and width of your boat slip? Is electricity – needed to power the boat lift or jet ski lift – available on your dock? Is any permitting required for the installation of a boat lift or jet ski lift? 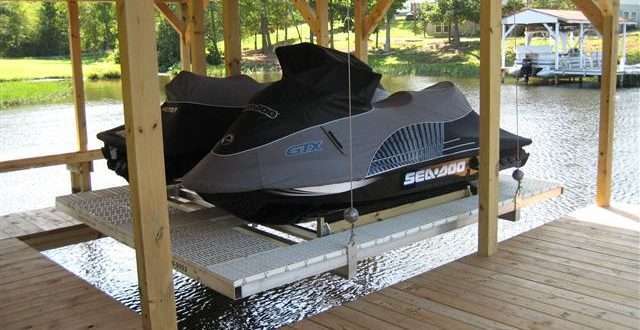 Your dock design will play the most major role in determining what type of boat lift or jet ski lift will be the best fit, you will also want to consider the water conditions as well. Most docks in this area, Gulf Shores, Orange Beach, Perdido, Elberta, Foley, are salt water which brings wood boring worms called shipworms but at Dock and Decks we offer top of the line pile wrap to protect your piling from these sea termites. Is the water activity around your dock mild, moderately rough, or severely rough? How active is electrolysis in the water around your slip? How much, how often, and how quickly does the water level at your dock fluctuate? Once we have agreed on a boat lift design that best matches your dock, Dock and Decks will custom build your hoist and lift to properly support your boat. What is the exact year, make, and model of your boat? What is the length and beam of your boat? What is the live weight of your boat? Don’t confuse the manufacturer’s listed dry weight with the live weight of your boat. Dry weight is exactly that. In most cases if you add 10% to the listed dry weight it will cover the items that you store on the boat. You also need to add the weight of the fuel and fresh water, as well as any water that may be in the holding tank or live wells. You will need to determine whether or not you wish to pull the boat or jet ski in forward or on a side slip. This is very important as it will determine where the boat lift or jet ski lift is placed in the slip, and it can also affect the parts that are used to assemble the boat lift. Overwhelmed with these questions, yet? This is where Dock and Decks brings their years of experience to make this process easy and right.. the first time. We hear daily.. “ well, can’t you JUST”… NO at Dock and Decks we never JUST do anything. This is your investment and we are here to build the best for each individual client. This is our specialty at Docks and Decks and we look forward to helping you make the best designed boat lift or jet ski lift for you! Share the post "Choosing the right lift for your boat lift or jet ski lift in Foley Alabama, Gulf Shores Alabama"